It’s very difficult to summon this sad year and I want to make clear from the beginning that the following words are my very personal reflections. 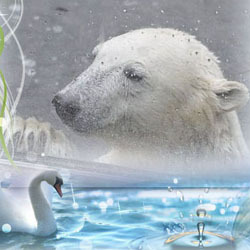 The year 2011 was an awful year for all the Knut friends and animal lovers all over the world. We started the year with great hopes and expectations but our world stopped going around on Saturday afternoon, March 19th. Our beloved Knuti had left us. The pain and sorrow are impossible to describe in words – the wound is still fresh and deep although almost ten months have gone from that tragic day. 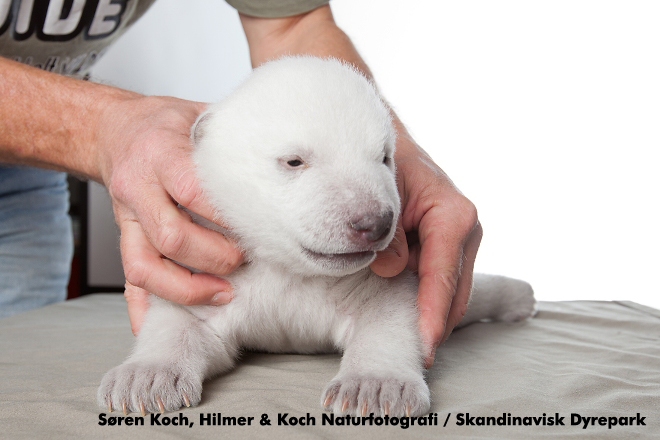 By the time I learnt to know Knut as a sweet cub I thought life was boring but suddenly I found things to enjoy again. Suddenly I had new energy and started doing things I never had imagined I could do. I’m sure this goes for many of you as well….. How quickly everything can change! The black Saturday took all the energy away, it took the brightness and light away, it made my ‘inner child’ feel old. I also felt quilt. I loved Knut so much but I couldn’t protect him. I couldn’t help him….. When I think back I really don’t know how I managed the first days after Knut’s death. One thing I do remember – I immediately decided that Knutitours and Knuti’s Weekly will continue to honour our beloved bear’s memory. They say ‘life must go on’ and, of course, life did go on but nothing was the same anymore. The Easter visit to Berlin was not the cheerful meeting we had hoped. The birthday meeting in December was a bittersweet occasion. As time goes by I realize more and more how much we all loved our Knuti. Nothing can bring him back – all we can do now is to make sure he will never be forgotten. Knuti’s true friends need no reminders – he will always live in our hearts. However, I hope we can make the beautiful story of the Dream Team in Berlin known even for those who were not ‘in it’. Dear Knuti, thank you for all the joy and happiness you brought into my life – and still do! For me a twinkling star, a falling leaf, a snow flake dancing in the air are messages from you. Yes, you still talk to me….. 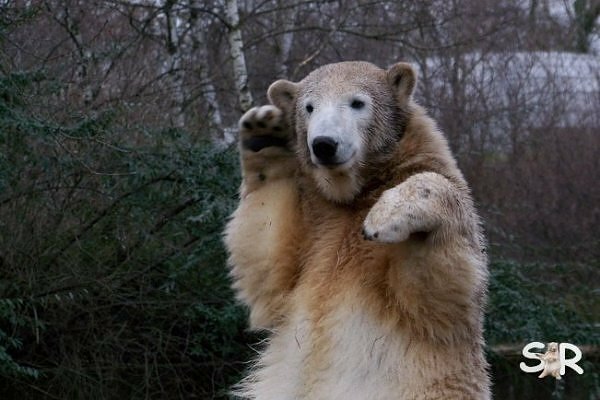 I also want to thank all the other Knut related blogs and forums for going on and cherishing the memory of Knut! I hope you will keep up with the fantastic work! 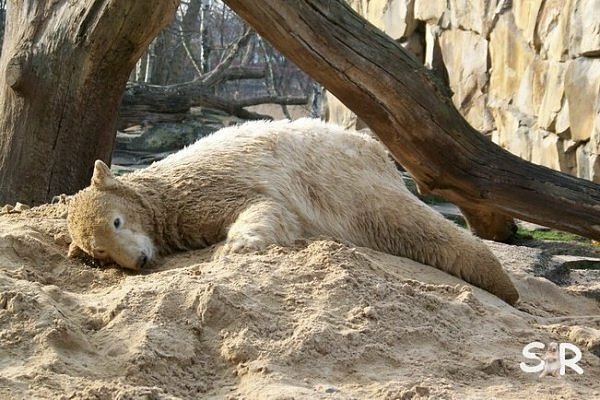 The year 2011 was a black year for the Berlin Zoo. Not only did they loose Knut – even Shaina Pali, KoRaya, Bhumipol and the sweet little lion cubs had to cross the Rainbow bridge. I wish from the bottom of my heart that the next year will be better for the animals and their keepers. The year 2011 had no mercy with us. When the hunting season started in Minnesota we were praying for Lily, Hope and Faith but our prayers were not heard. Hope was killed by a brainless hunter. Why the hell is hunting allowed in the area where the ‘protected’ bears live??? The feeling of sadness was – and is – connected with great fury! 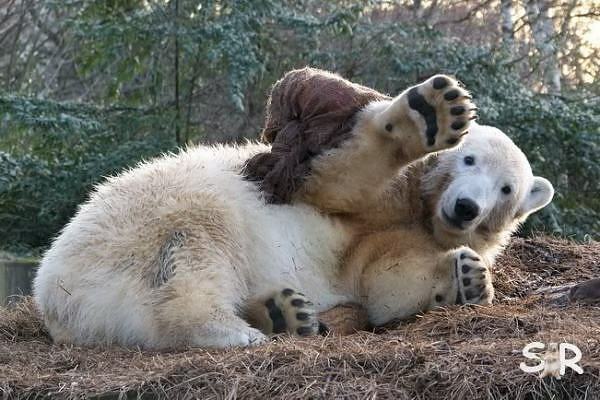 We also lost two faithful Knut friends – Hartmuth and Erika. Somehow it feels like the years of innocence and childish happiness are gone…. even though I hope we can get at least some of the joy of life back. Of course, there were also some happy moments during the year. When we were in deep mourning the light and brightness came from Alaska. 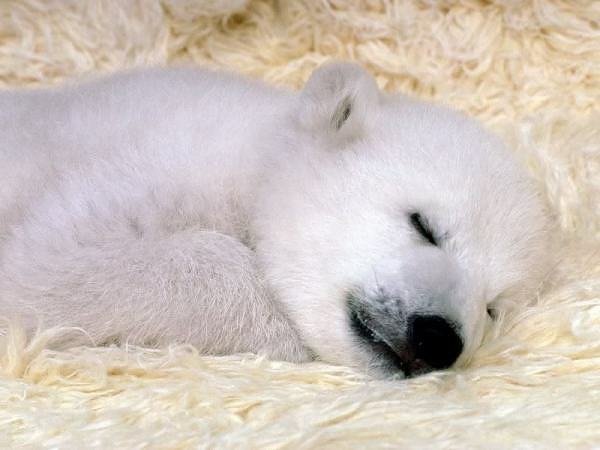 A little polar bear girl was found abandoned and brought to the Alaska Zoo. I’m convinced she was sent to comfort us and she certainly carried out her job brilliantly. The cub, Qannik, is now living in the Louisville Zoo in Kentucky and I wish her and her keepers a wonderful time together. I also send my grateful greetings to Pat Lampi and John Gomes in Alaska who kept us informed about the little cub with reports, photos and videos. I hope you know how much they ment to us! 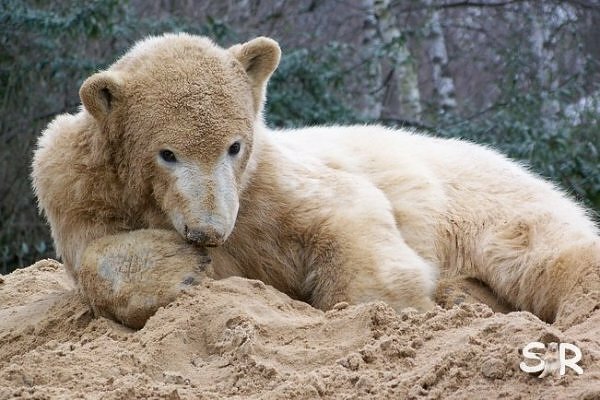 We have also had good news from different zoos where polar bear cubs have been born – Toronto, Rhenen, Ranua and Kolind – just to mention some of them. All these cubs are precious jewels and I wish them all a long and happy life! Of course, we mustn’t forget all the cubs born in the wilderness. My heart is aching when I think of the starving mother bears trying to feed their cubs. Under those poor living circumstances every cub that survives is a true miracle! I hope our sweet fluffy bear angel is watching over them all – as a matter of fact I know he is! Sadness and happiness go hand in hand but this year sadness was walking more with sadness…. However, I’m convinced that just like the bird Fenix we will rise from the ashes and be happy again cherishing our beautiful memories. I hope I haven’t made you depressed. Somehow it just felt necessary to make a kind of ‘final account’ of the year that’s gone. It’s time to thank all the contributors who make this magazine for what it is. Caren, the co-editor-in-chief, thank you for your efforts not only for reports, photos and videos but for making the Gnadenhof project such a great success! My best new year greetings to all the bears and keepers in Gnadenhof! Bernd, thank you for the fantastic videos. Ludmila, thank you for your globetrotter reports from Europe and USA! Teddybärenmutti, thank you for your funny but also touching stories. Bärgit, thank you for your brilliant translations! Our eminent Berlin reporters Dumba, Gudrun, Monika, Yeo, SylviaMicky – thank you all for your great reports from our ‘home zoo’ in Bärlin! Frans, Violetta, Knuti-Judi, Crissi, Ralph, Doris & Jessie, Patricia, Bea and all contributors of articles and photos – thank you so much. I hope you keep on posting here even during the next year! The Nuremberg photographers, thank you so much for sharing your wonderful photos from Nuremberg and Antibes with us. Vielen Dank! My special thanks to Anders Björklund in Orsa. Your fantastic photos are always a highlight for Knuti’s Magazine! Finally I want to thank all the photographers who so generously allow me to use their pictures. I don’t write any names because I’m afraid I might forget someone. I want to end this ‘new year’s speech’ with wishes of hope, joy, beauty, love and happiness for the next year. The year 2011 taught us never to take anything for granted. Things can change so abruptly. I hope we’ll all remember not to make a fuss about things that really don’t matter. We are not perfect, things we do may not be perfect – so what! Es ist sehr schwer, dieses traurige Jahr zusammenzufassen, und ich will gleich klarstellen, dass die folgenden Worte mein ganz persönlichen Gedanken sind. 2011 war ein furchtbares Jahr für alle Knutfreunde und Tierliebhaber auf der ganzen Welt. Wir fingen das Jahr mit großen Hoffnungen und Erwartungen an, aber unsere Welt stand still Samstagnachmittag, am 19. März. Unser geliebter Knuti hatte uns für immer verlassen. Es ist unmöglich, den Schmerz und die Trauer in Worte zu fassen – die Wunde ist noch immer frisch und tief, obwohl seit diesem tragischen Tag bereits 10 Monate vergangen sind. Bevor ich Knut als süßes Baby kennenlernte, hielt ich das Leben für langweilig, aber plötzlich fand ich Dinge, die mir wieder Spaß machten. Plötzlich hatte ich neue Energien und begann, Dinge zu tun, von denen ich überhaupt nicht wusste, dass ich sie machen konnte. Ich bin mir ziemlich sicher, dass das für viele von uns zutrifft….Wie schnell sich alles ändern kann! Der Schwarze Samstag löschte all die Energie aus, er nahm den Glanz und das Licht, er machte, dass sich mein „inneres Kind” sehr alt anfühlte. Ich empfand auch Schuld. 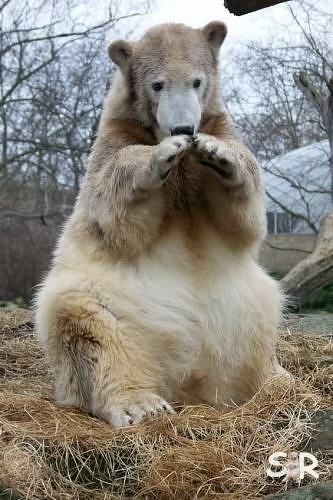 Ich liebte Knut so sehr, aber ich konnte ihn nicht beschützen. Ich konnte ihm nicht helfen…. Wenn ich zurückdenke, weiß ich wirklich nicht mehr, wie ich die ersten Tage nach Knuts Tod bewältigte. An eines erinnere ich mich aber – ich beschloss sofort, dass es Knutitours und Knuti’s Weekly weiterhin geben sollte, um die Erinnerung an unseren geliebten Bären wachzuhalten. Man sagt so leicht „das Leben muss weitergehen” und natürlich ging das Leben auch weiter, aber nichts war mehr wie vorher. Der Berlinbesuch an Ostern war nicht das fröhliche Treffen, auf das wir uns gefreut hatten. Das Geburtstagstreffen im Dezember war eine bittersüße Angelegenheit. Im Laufe der Zeit wurde mir immer klarer, wie sehr wir alle unseren Knuti liebten. Nichts kann ihn je wieder zurückbringen – das einzige, was wir tun können, ist sicherzustellen, dass er niemals vergessen wird. Knutis echte Freunde muss man daran nicht erinnern – er wird auf immer in unseren Herzen leben. Aber ich hoffe, wir können diese wunderbare Geschichte vom Dream Team in Berlin auch an diejenigen weitergeben, die nicht unmittelbar ‚dabei‘ waren. Lieber Knuti, vielen Dank für all die Freude und das Glück, das du in mein Leben gebracht hast – und noch immer bringst! Für mich sind ein funkelnder Stern, ein Blatt, das vom Baum fällt, eine Schneeflocke, die in der Luft tanzt, kleine Botschaften von dir. Ja, du sprichst noch immer mit mir…. Ich möchte all den anderen Knut Blogs und Foren danken, dass sie weitermachen und die Erinnerung an Knut liebevoll aufrechterhalten. Ich hoffe, ihr macht mit eurer fantastischen Arbeit weiter! Das Jahr 2011 war ein schwarze Jahr für den Berliner Zoo. 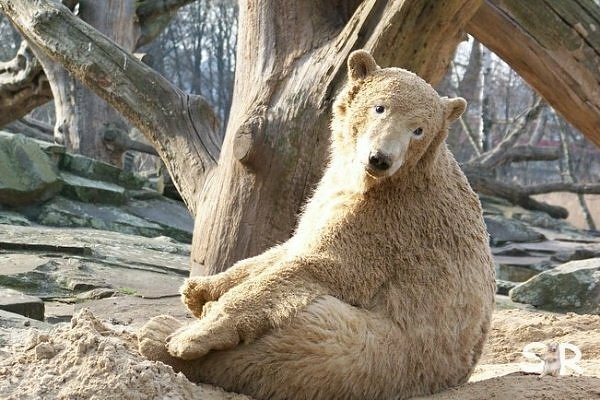 Nicht nur, dass sie Knut verloren – auch Shaina Pali, KoRaya, Bhumipol und die süßen kleinen Löwenbabys mussten über die Regenbogenbrücke gehen. Ich wünsche mir von ganzem Herzen, dass das neue Jahr ein besseres für die Tiere und ihre Pfleger wird. Das Jahr 2011 kannte keine Gnade für uns. Als in Minnesota die Jagdsaison begann, beteten wir alle für Lily, Hope und Faith, aber unsere Gebete wurden nicht erhört. Hope wurde von einem hirnlosen Jäger getötet. Warum zum Teufel erlaubt man in einer Gegend das Jagen, in der ‚geschützte‘ Bären leben??? Das Gefühl der Traurigkeit war – und ist – mit großem Zorn verknüpft! Wir verloren auch zwei treue Knutfreunde – Hartmuth und Erika. Irgendwie fühlt es sich so an, als ob die Jahre der Unschuld und der kindlichen Freude vorbei sind … obwohl ich hoffe, dass wir wenigstens ein bisschen von unserer Lebensfreude zurückbekommen können. Natürlich hatte das Jahr auch ein paar schöne Momente. Als wir in tiefer Trauer waren, kam das Licht und Strahlen aus Alaska. 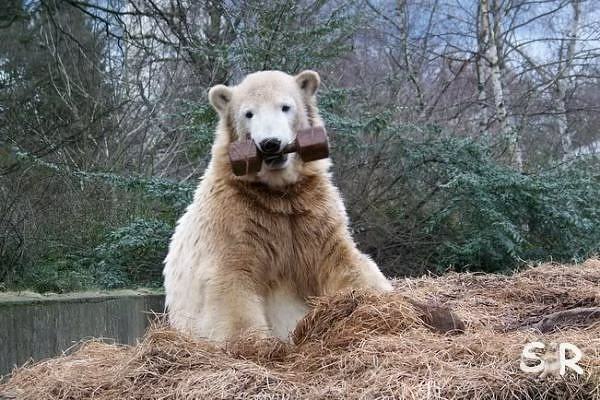 Ein kleines Eisbärmädel war verlassen aufgefunden und in den Alaska Zoo gebracht worden. Ich bin mir sicher, dass sie uns zum Trost geschickt wurde und diese Aufgabe hat sie ganz gewiss hervorragend erledigt. Die Kleine, Quannik, lebt nun im Lousville Zoo in Kentucke und ich wünsch ihr und ihren Pflegern eine wunderbare gemeinsame Zeit. Meine dankbaren Grüße gehen auch Pat Lampi und John Gomes in Alaska, die uns über das Eisbärkind in Berichten, Bildern und Videos informierten. Ich hoffe, sie wissen, wie viel sie uns bedeuteten! 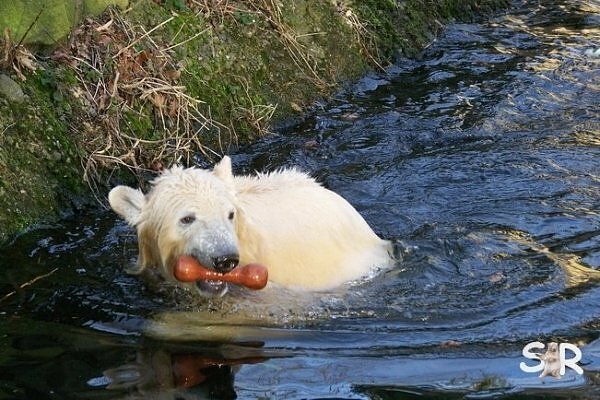 Es gibt auch gute Nachrichten aus verschiedenen Zoos, in denen Eisbärbabys zur Welt kamen – Toronto, Rhenen, Ranua und Kolind – um ein paar zu nennen. Alle diese Welpen sind kostbare Juwelen und ich wünschen ihnen allen ein langes und glückliches Leben! Natürlich dürfen wir die Eisbärbabys nicht vergessen, die in der Wildnis geboren werden. Mir tut es im Innersten weh, wenn ich an die hungernden Bärenmütter denke, die versuchen, ihre Kleinen zu nähren. Unter diesen extremen Lebensbedingungen ist jedes Junges, das überlebt, ein wahres Wunder! Ich hoffe, dass unser süßer fluffiger Bärenengel auf sie alle aufpasst – und in der Tat weiß ich, dass er das tut! Freude und Leid gehen Hand in Hand, aber in diesem Jahr, war das Leid öfter mit dem Leid unterwegs… Aber ich bin mir sicher, dass wir uns wie der Vogel Phönix aus der Asche erheben und wieder fröhlich sein werden und unsere schönen Erinnerungen wertschätzen werden. Ich hoffe, dass ich euch nicht deprimiert habe. Aber irgendwie hatte ich das Bedürfnis, eine Generalabrechnung mit dem Jahr, das jetzt vorbei ist, zu machen. Es ist auch die Zeit, allen für ihre Beiträge zu danken, die das Magazin zu dem machen, was ist. Caren, Vize-Chefredakteurin, danke für all deine Mühen nicht nur für die Berichte, Fotos und Videos, sondern auch, dass du das Gnadenhofprojekt zu so einem großen Erfolg geführt hat! Allen Bären und Pflegern im Gnadenhof meine herzlichsten Neujahrsgrüße! Bernd, danke für deine fantastischen Videos! Ludmila, danke für deine Globetrotterberichte aus Europa und den USA! Teddybärenmutti, danke für deine witzigen und auch berührenden Geschichten! Bärgit, danke für deine brillanten Übersetzungen! Unsere ausgezeichneten Berlinreporterinnen Dumba, Gudrun, Monika, Yeo, SylviaMicky – danke euch allen für eure tollen Berichte aus ‚unserem Zoo‘ in Bärlin! Frans, Violetta, Knuti-Judi, Crissi, Ralph, Doris Jessie, Patricia, Bea und allen die Berichte und Bilder beisteuern – vielen Dank. Ich hoffe, ihr postet im neuen Jahr weiter! Den Nürnberger Fotografen, vielen Dank, dass ihr eure wunderschönen Bilder aus Nürnberg und Antibes mit uns teilt. Vielen Dank! Mein besonderer Dank gilt Anders Björklund in Orsa. Deine fantastischen Bilder sind immer ein echtes Highlight im Knuti’s Magazine! Zu guter Letzt, möchte ich noch all den Fotografen und Fotografinnen danken, die mir so großzügig erlaubt haben, ihre Fotos zu verwenden. Ich nenne jetzt keine Namen, weil ich Angst habe, ich könnte einen vergessen. Ich möchte diese ‚Neujahrsansprache‘ schließen mit den besten Glückwünschen für Hoffnung, Freude, Schönheit, Liebe und Glück in neuen Jahr. Das Jahr 2011 hat uns gelehrt, dass man nichts für sicher ansehen kann. Die Dinge können sich von jetzt auf gleich ändern. Ich hoffe, wir regen uns nicht mehr über Unwichtiges auf. Wir sind nicht perfekt und das was wir tun, ist vielleicht auch nicht perfekt – aber was soll’s! Knut has always helped me with the new year’s greetings and he does it even this time. Who could illustrate love and beauty better than our Knuti? The photos below are by Simone (Frühlingsstern) taken in February 2008. Knut hat mir immer bei meinen Neujahrsgrüßen geholfen – auch diesmal. Wer könnte Liebe und Schönheit besser veranschaulichen als unser Knuti? Die folgenden Fotos sind vom Februar 2008 und wurden von Simone (Frühlingsstern) gemacht. Danke soviel. Du hast richtige Wörter gefunden. Knut-Engel sicher war eine grosse Helfer. Er zeigte Dir, was sollst Du schreiben. Thank you for your honest and still comforting words. And I know you only wrote down what Knuti himself couldn’t since there is no keyboard knut enough for his paws. Du hast sehr berührende Worte gefunden! Ich hoffe auch sehr, dass 2012 ein besseres Jahr wird. 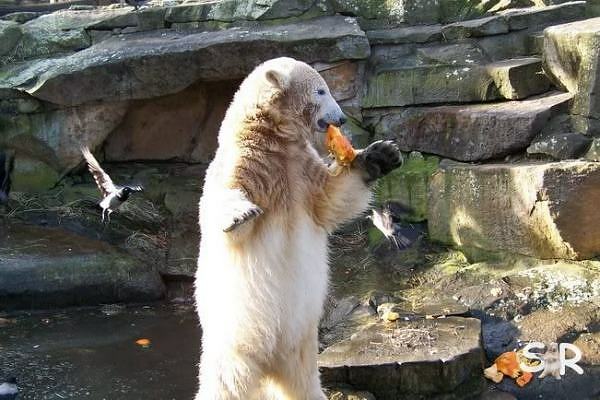 Tonya und Siku eine gute Zukunft in ihren Heimatzoos. ihr Leben kämpfen im immer wärmer werdenden Norden. Jahr 2012. Kommt gut rüber ins neue Jahr! You speak from the heart; indeed, from the hearts of all of us here. Our precious boy physically left us far too soon… but he does live on in our hearts and in the many wonderful memories. As I read your words, I found myself reliving those first horrible days after March 19th… but then I scrolled down to Simone’s photos and couldn’t help but smile. 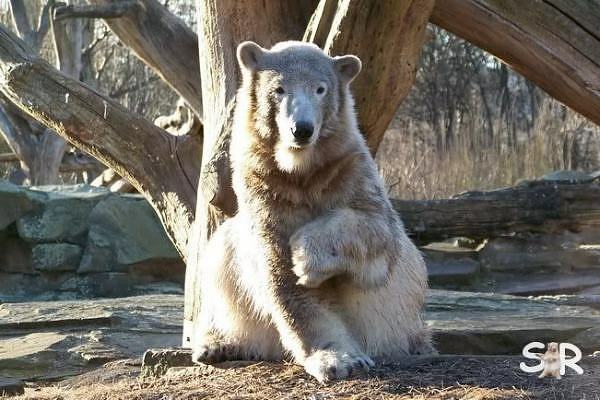 What an amazing bear our Knuti was… and remains. ich kann mich der vorangegangenden Worten nur anschließen. Ein schöner, und dennoch berührender Bericht. Auch ich hoffe, dass das Jahr 2012 in vieler Hinsicht besser wird als das Jahr 2011, in dem wir viel zu viel junge Tiere, aber auch liebgewonnene Menschen verloren haben. Ich wünsche Allen einen guten Rutsch ins Neue Jahr, und bleibt oder werdet gesund. danke für diese berührenden Bericht. Möge das Jahr 2012 für Mensch und Tier besser werden. Dear Mervi, you wrote a beautiful letter. Before reading it, I felt quite light hearted today, now I am sad but this is OK. All I want to say at the moment is: THANK YOU! For me, 2011 was a very bad year. Physical ailments and the loss of some friends as well as Knut had me waiting for the year to end. 2011 was like a bad dream. My corner of escape won’t be the same, but I thank you for carrying on through your grief and keeping Die Knuipe alive. so schöne Worte und so schöne Fotos. Vielen Dank für alles! Ein frohes neues Jahr! Es kann nur besser werden. Wir wünschen dir und all deinen Lesern ein guten Rutsch in ein gesundes und glückliches neues Jahr. There’s not much I can add, expect that my articles will be coming as long as you want to publish them :-). A happy new year to you and yours, and to all the contributors and readers of the Magazine. from the bottom of my heart thank you so much for your touching Rückblick review to the year 2011. Dear Mervi, your words are so true. That black Saturday took away our energy, joy and light and made our inner child growing old too sudden. But together we can remember. I thank you for your continuing Knutitours. I am sure that I would never ever had that courage after all that happened. Thank you for Knutisweekly and for Knuipe. It was a bad year for us. 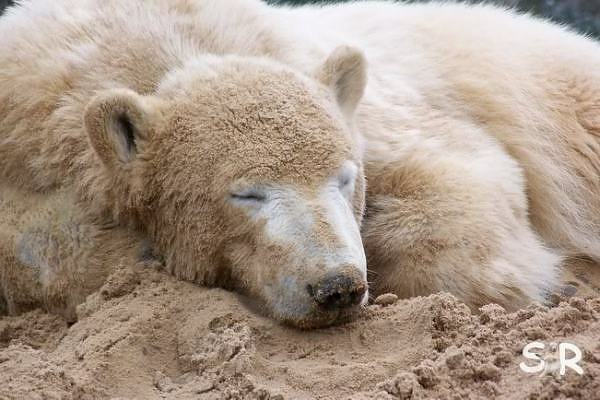 It is difficult to live without Knut. I am very glad, that we have our community to stay together. Thank you for sharing your pain with us. Shared pain is much easier to live with…you have provided a wonderful place here in KWM and the Knuipe for us all to discuss Knuti and what he has meant to us and the world. It has been a relief to have friends to talk with who understood the sorrow of Knut’s passing. Thank you for making the decision to continue on with KWM and the Knuipe. In doing so you are helping to continue to spread Knut’s message of love and proper care of the earth and all of its inhabitants. I am sure Knut Angel is very proud of you. So right so right. And now we have the memories and each other. Thank you for the wonderful work you do here and thank you to all that write and send wonderful stories and pictures. Simones pictures are wonderful and the article is so touching. I wish you and all here all the best for 2012. May the world be a better place for humans, animals and nature. thank you for your NewYear’sSpeech ~ true words from the bottom of your heart and maybe all of our hearts too. That’s why they are so touching. Thank you once more. No, the last year wasn’t the best, overshaded by the passing of Knuti and other beloved furry personalties, but most of all by the loss of my beloved Luzi. But that year also brought great joy in a white-and-black furcoat for me. der Artikel geht sehr zu Herzen. Das vergangene Jahr war schlimm. Du hast es sehr gut beschrieben. Many thanks for your beautiful words. I am still mourning our Knuti and I am still deeply in pain. I am silent as I still can not find words to express my sorrow since this horrible day (19 march 2011). Many thanks for this wonderful site and Happy New Year to you, Vesa and all the Knuti’s fan. You have put into words what is in our hearts. Thank you for all the work you do to keep Knuti with us and to bring joy to us, also. Yes, I know I have lost my “inner child” since Knuti has left but wasen’t it wonderful to have experienced it for as long was we were able. It is so difficult to try to remember that Knuti is with his Papi now and he is happy playing and running and loving sweet Thomas and not with us physically. But . . . he will always be with us in our hearts. thank you very much for your touching review of 2011. Yes indeed, it was a very painful year not only because of Knut’s sudden dead but also because of the loss of so many beloved human and animal companions and friends. And I hope that our worldwide community will really be aware of that. Let’s hope the best for 2012 – as a better year with more good than bad news. Thank you also for your never ending warmth, your ideas and energy which you are spending to the Knutian world. Danke für die deutsche Übersetzung. Ist für mich einfacher zu lesen. einfach einen von Herzen kommenden Dank. thank you for your words. It was a very sad year. I wish you a better an d happy new year! thank you so much for your emotional words. All the year through we had to cope with losses, one after the other. How sad the past year was is becoming so realistic when reading this article. Of course, it makes one even more sad, but you have found the right words when listing all the losses of this “annus horribilis”. 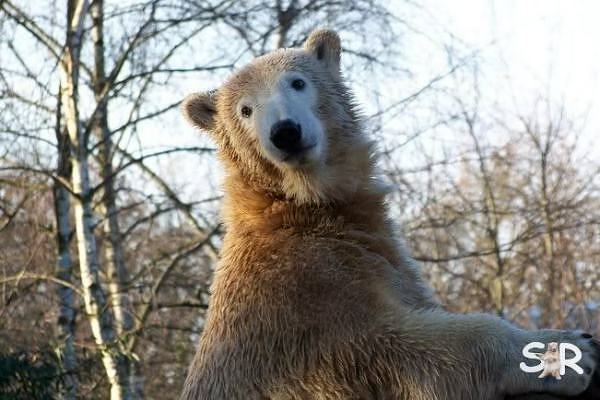 I am very optimistic that the new year 2012 will be a better one, because after each rain the sun will be shining again, and although Knut is gone the miracle he had started will be ongoing. All our friends who are now on the other side of the rainbow bridge will be in our hearts forever. Thank you ever so much for all your efforts to keep Knut’s heritage together. You run a wonderful magazine, which really is unique. There is no better place to stay together than in the KNUIPE where we can laugh and cry together. Let us hope that the laughing occasions will be far more this year than the crying ones.